Information regarding the association between prehypertension BP level and renal arteriosclerosis is limited. In 652 consecutive population-based autopsy samples without hypertension treatment before death, the relationship between the severity of renal arteriosclerosis and BP levels classified according to the criteria of the Seventh Report of the Joint National Committee on Prevention, Detection, Evaluation, and Treatment of High Blood Pressure was examined. The age- and gender-adjusted frequencies of renal arteriosclerosis linearly increased with elevating BP levels; both hypertensive and prehypertensive subjects had significantly higher frequencies of renal arteriosclerosis than subjects with normal BP (normal 11.9%; prehypertension 28.5%; stage 1 hypertension 32.9%; stage 2 hypertension 58.2%; all P < 0.01 versus normal). In a logistic regression model, prehypertension was significantly associated with renal arteriosclerosis after adjustment for other cardiovascular risk factors (prehypertension multivariate-adjusted odds ratio [mOR] 5.99 [95% confidence interval (CI) 2.20 to 15.97]; stage 1 hypertension mOR 6.99 [95% CI 2.61 to 18.72]; stage 2 hypertension mOR 22.21 [95% CI 8.35 to 59.08]). This significant association was observed for all renal arterial sizes. The similar association was also observed for arteriolar hyalinosis. When the subjects were divided into those with and those without target organ damage, the impact of prehypertension on renal arteriosclerosis was similar for both groups (subjects without target organ damage mOR 5.04 [95% CI 1.36 to 18.62]; subjects with target organ damage mOR 6.42 [95% CI 1.29 to 32.04]). These findings suggest that both hypertension and prehypertension are associated significantly with the severity of renal arteriosclerosis, regardless of the presence or absence of target organ damage. A prospective population-based study of cardiovascular disease has been carried out since 1961 in the town of Hisayama on Kyushu Island in southern Japan. The most characteristic feature of the Hisayama Study is that the cause of death has been verified by autopsy for approximately 80% of deceased subjects in the study population.10–13 Our previous autopsy reports of Hisayama residents showed that systolic BP (SBP) was closely related to the progression of glomerular sclerosis, renal arteriolar hyalinosis, and renal arteriosclerosis.12,13 To our knowledge, the Honolulu Heart Program is the only other population-based study that has examined this issue, although the autopsy rate was not high (20.6%).14,15 Their findings also suggested that diastolic BP (DBP) was an independent predictor of glomerular sclerosis, renal arteriolar hyalinosis, and renal arteriosclerosis.14,15 However, the association between categorized BP levels and renal vascular changes was not assessed in these studies or in ours. In this study, we examined the relationship between BP levels and renal arteriosclerosis, focusing on prehypertension, in population-based autopsy samples of the Hisayama Study, taking into account other cardiovascular risk factors as well as renal artery size. The baseline characteristics of the 652 autopsy subjects are represented according to the BP levels in Table 1. The subjects with stage 1 or stage 2 hypertension were older than those with normal BP. The proportions of women gradually increased with elevating BP levels. The mean GFR values decreased significantly in stage 2 hypertension relative to normal BP level, whereas serum creatinine levels did not change across BP levels. The frequencies of proteinuria and history of cardiovascular disease were significantly higher in subjects with stage 2 hypertension, and that of electrocardiogram (ECG) abnormalities increased linearly with elevating BP levels. The mean values of total cholesterol were significantly higher in subjects with hypertensive or prehypertensive BP levels, whereas the frequency of glucose intolerance and the mean value of body mass index (BMI) did not change across BP levels. The frequency of current smoking decreased gradually with elevating BP levels, but no such tendency was observed for the frequency of alcohol intake. Figure 1 presents the age- and gender-adjusted frequencies of renal arteriosclerosis, arteriolar hyalinosis, and glomerular sclerosis according to BP classification. The frequencies of renal arteriosclerosis and arteriolar hyalinosis linearly increased with elevating BP levels; not only hypertensive subjects but also prehypertensive subjects had a significantly higher frequency of renal arteriosclerosis and arteriolar hyalinosis compared with subjects with normal BP. Likewise, the age- and gender-adjusted mean values of the wall-lumen ratio of renal arteries decreased linearly (normal 5.10; prehypertension 4.16; stage 1 hypertension 3.96; stage 2 hypertension 3.47; all P < 0.01 versus normal), and those of the arteriolar hyalinosis index increased gradually with elevating BP levels (normal 1.21; prehypertension 1.29 [P < 0.05 versus normal]; stage 1 hypertension 1.29 [P < 0.05]; stage 2 hypertension 1.38 [P < 0.01]). The severity of glomerular sclerosis increased significantly in only stage 2 hypertension. The age- and gender-adjusted odds ratios (OR) of renal arteriosclerosis and arteriolar hyalinosis were significantly higher in prehypertension subjects and in hypertension subjects than in normal ones (Table 2). This association remained substantially unchanged even after adjustment for age at death, gender, total cholesterol, glucose intolerance, BMI, smoking habits, and alcohol intake. Furthermore, we divided prehypertension into two subcategories—BP 120 to 129/80 to 84 mmHg and BP 130 to 139/85 to 89 mmHg—and examined the association between BP level and renal arteriosclerosis. As a result, the risk for having renal arteriosclerosis was significantly increased in both BP subcategories even after adjustment for the previously mentioned cardiovascular risk factors (BP 120 to 129/80 to 84 mmHg OR 5.93 [95% confidence interval (CI) 2.08 to 16.91; P < 0.01]; BP 130 to 139/85 to 89 mmHg OR 5.92 [95% CI 2.02 to 17.29; P < 0.01]). 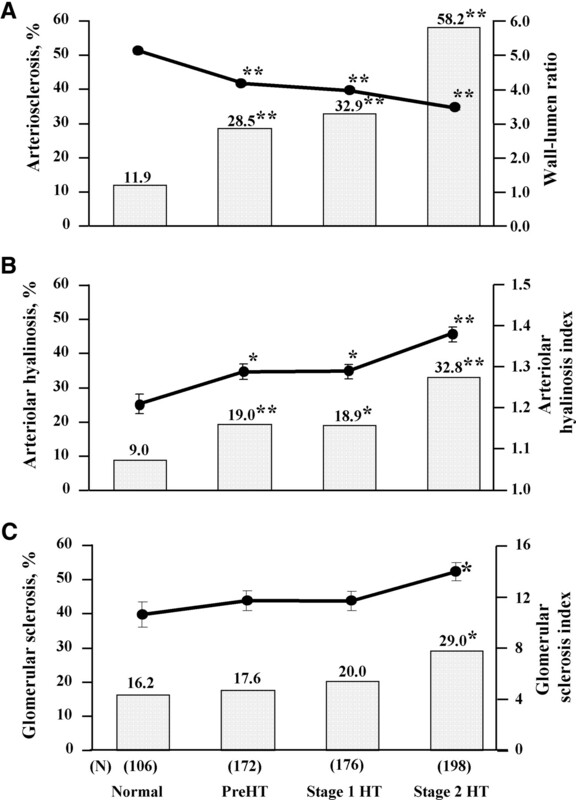 Age- and gender-adjusted frequencies of renal arteriosclerosis (A), arteriolar hyalinosis (B), and glomerular sclerosis (C) according to BP classification among 652 autopsy subjects. Solid lines indicate age- and gender-adjusted mean values of wall-lumen ratio, arteriolar hyalinosis index, and glomerular sclerosis, respectively. PreHT, prehypertension; HT, hypertension. *P < 0.05, **P < 0.01 versus normal. We examined whether the association between BP and renal arteriosclerosis differs by the presence or absence of target organ damage. As shown in Figure 2A, the age- and gender-adjusted frequencies of renal arteriosclerosis were higher in the group with target organ damage than in the group without it, regardless of BP level. In both groups, however, the frequencies of renal arteriosclerosis increased significantly with elevating BP levels; the difference was significant between the normal and both the prehypertension and hypertension categories. Likewise, the mean values of the wall-lumen ratio of renal arteries were significantly lower in BP levels of prehypertension and hypertension than in normal BP level for both the target-organ-damaged and target-organ-undamaged groups (Figure 2B). As shown in Table 3, the impact of prehypertension on renal arteriosclerosis was similar for both the damaged and undamaged groups after adjustment for the previously mentioned cardiovascular risk factors (without target organ damage OR 5.04 [95% CI 1.36 to 18.62; P < 0.05]; with target organ damage OR 6.42 [95% CI 1.29 to 32.04; P < 0.05]). Age- and gender-adjusted frequencies of renal arteriosclerosis (A) and mean values of wall-lumen ratio of the renal arteries (B) according to BP classification by the presence or absence of target organ damage among 652 autopsy subjects. TOD, target organ damage; *P < 0.05, **P < 0.01 versus normal in target organ damage (−); $P < 0.05, $$P < 0.01 versus normal in target organ damage (+). Multivariate-adjusted OR for renal arteriosclerosis according to BP classification by the presence or absence of target organ damage. Finally, we examined the associations between BP levels and renal arteriosclerosis by the size of renal arteries using logistic regression analysis (Table 4). After adjustment for the previously mentioned cardiovascular risk factors, both prehypertension and hypertension significantly increased the risk for having renal arteriosclerosis in all arterial sizes. For smaller arteries (<300 μm), the risk for arteriosclerosis significantly and linearly increased with elevating BP levels, whereas this linear association was diminished for larger arteries (≥300 μm). In this population-based autopsy survey, we histopathologically examined the relationship between categorized BP levels classified according to the JNC-7 criteria and renal arteriosclerosis. The results showed that both hypertension and prehypertension were associated significantly with renal arteriosclerosis, without regard for the presence or absence of target organ damage or for the size of intrarenal arteries. The relationships between BP and renal histopathologic changes also have been reported in the several biopsy-based studies of living subjects. Lhotta et al.16 showed in patients who underwent biopsy that SBP was associated significantly with the frequencies of glomerular sclerosis and arteriolar hyalinosis. According to the study for patients with biopsy-proven IgA nephropathy, patients with hypertension, defined as BP ≥140/90 mmHg, had more severe glomerular sclerosis, interstitial fibrosis/tubular atrophy, interstitial infiltration, and atherosclerosis compared with those without hypertension.17 In a similar biopsy study for IgA nephropathy, prehypertension (BP 120 to 139/80 to 89 mmHg) was associated significantly with the severity of mesangial proliferation and arteriolar changes, including intimal thickening, intimal duplication or hyalinosis, but not glomerular sclerosis.18 These findings are in accordance with those of our study. Several recent reports have shown that the risk for the development of cardiovascular disease or the risk for the progression to hypertension initiates an increase in BP levels of ≥120/80 mmHg. A meta-analysis of individual data for 1 million adults in 61 prospective studies indicated that the mortality from both ischemic heart disease and stroke increased progressively and linearly from BP levels as low as SBP of 115 mmHg and DBP of 75 mmHg in middle and old age.6 In addition, longitudinal data that were obtained from the Framingham Heart Study indicated that high-normal BP and normal BP, defined by JNC-6, were associated with the occurrence of cardiovascular disease.7 Moreover, according to the randomized, controlled trial conducted in the Modification of Diet in Renal Disease (MDRD) study, low target BP (mean BP <92 mmHg, equivalent to a BP <125/75 mmHg) reduced the risk for developing kidney failure by approximately 30% compared with the usual target BP (mean BP <107 mmHg, equivalent to a BP <140/90 mmHg).19 Our findings also showed that prehypertension levels were significantly associated with renal arteriosclerosis and arteriolar hyalinosis. It may be reasonable to suppose that prehypertension promotes systemic arteriosclerosis including renal vascular changes and causes cardiovascular disease and renal dysfunction. It is possible that prehypertension is not the cause of renal arteriosclerosis but the result of renal vascular changes or organ damages by other cardiovascular risk factors. In this study, however, prehypertension was clearly associated with renal arteriosclerosis, regardless of the presence or absence of target organ damage, and this association was significant even after adjustment for other cardiovascular risk factors. This suggests that a slight increase in BP to prehypertension levels was associated independently with the severity of renal arteriosclerosis. Therefore, it is possible that antihypertensive treatment with BP-lowering <120/80 mmHg prevents the progression of renal arteriosclerosis, regardless of the presence or absence of target organ damage. In our study, the relationship between BP levels and renal arteriosclerosis differed somewhat according to the size of renal arteries; the risk for renal arteriosclerosis increased significantly and linearly with elevating BP levels in smaller arteries (<300 μm), including arterioles, whereas this phenomenon was diminished in larger arteries (≥300 μm). Instead, the impact of total cholesterol levels was reinforced with elevating renal arterial size in our subjects (data not shown). In autopsy findings from the Honolulu Heart Program, BP was associated strongly with the intimal thickness of renal arteries with an outer diameter of 80 to 300 μm, but there were no correlations between the intimal thickness of these renal arteries and other cardiovascular risk factors, such as total cholesterol, triglycerides, blood glucose, and smoking.14 It is feasible to speculate that the degree of the atherogenic effects of risk factors varies according to artery size and that hypertension affects small arteries notably. Several limitations of our study should be discussed. First, our findings might be biased by the exclusion of 187 subjects who were taking antihypertensive medications. The mean values of SBP, DBP, serum creatinine, and total cholesterol and the frequencies of proteinuria, ECG abnormalities, glucose intolerance, and history of cardiovascular disease were significantly higher and the mean values of wall-lumen ratio were significantly lower in subjects who were taking antihypertensive medications than in the 652 subjects without antihypertensive medications in the present study. This bias has the potential to underestimate the impact of hypertension or other cardiovascular risk factors on renal arteriosclerosis. However, it is unlikely that this bias affects the association between prehypertension and renal arteriosclerosis, because prehypertensive subjects did not use antihypertensive medication. Second, only a single BP measurement was obtained at the baseline examination in the recumbent position. This imperfect measurement of BP might have resulted in a misclassification of our study subjects into different BP categories and a consequent dilution of our estimates of BP's impact on renal arteriosclerosis. Third, this is a cross-sectional study. Therefore, it is difficult to infer causality between prehypertension and risk for progression of renal arteriosclerosis, because it may be presumed that BP increased as a result of renal ischemia by preexisting renal arteriosclerosis, acting mainly through the renin-angiotensin system. In any case, our findings suggest that subjects with prehypertension should be considered as those with more progressive renal arteriosclerosis. Fourth, several variables used in this study were less accurate. We used the MDRD equation to estimate GFR; this formula is notoriously inaccurate in patients with normal kidney function. Proteinuria was established as 1+ or more on the dipstick; this would have missed all subjects with microalbuminuria. In addition, the definition of glucose tolerance varied depending on when the examination was done. These facts might lead to the misclassification of a normal subgroup without any risk factor and affect the cutoff value of each histologic parameter. However, it seems to be unlikely that this limitation distorted the associations between BP levels and severity of renal arteriosclerosis, because BP levels showed the dosage-dependent association with the continuous values of wall-lumen ratio. Finally, this study is based on autopsy and the proportion of aged people is extremely high. Therefore, its findings cannot be applied to the overall living population. However, we believe that our findings provide useful information toward a better understanding of the pathogenesis of renal arteriosclerosis. Prehypertension level classified by JNC-7 was associated significantly with the severity of renal arteriosclerosis. Therefore, prehypertensive individuals should be considered a high-risk population, regardless of the presence or absence of target organ damage. Our findings emphasize the need to determine whether the lowering of goal BP in hypertension management can prevent the progression of renal and systemic arteriosclerosis. The population of the town of Hisayama is approximately 7500, and data from the national census show it to be representative of Japan as a whole.10,11 The study design and characteristics of the subject population have been described in detail elsewhere.12,13 Briefly, from January 1962 to December 1994, a total of 1742 Hisayama residents of all age groups died, 1394 (80.0%) of whom underwent autopsy. The autopsy rate was not different between men (78.7%) and women (81.6%). Among these consecutive autopsy subjects, 1168 participated in at least one of the six health examinations conducted in 1961, 1967, 1974, 1978, 1983, and 1988. For every examination, the participation rate exceeded >80% of all Hisayama residents 40 yr or older. After exclusion of 98 subjects who lacked preserved renal tissues, 33 with degenerated or small renal tissues, 80 who underwent autopsy at other hospitals, 118 who had no health examination data within 7 yr before death, and 187 who had been treated with antihypertensive medications, 652 subjects (362 men and 290 women) were included in this study. The mean period from the most recent health examination to death was 3.6 ± 1.8 yr. The methods of morphologic examination of renal tissue have been described in detail elsewhere.13 Briefly, for light microscopic study, paraffin-embedded renal tissues that were obtained by standard autopsy methods were cut at a 2-μm thickness and stained with periodic acid-Schiff reagent. The wall-lumen ratio was evaluated as the severity of arteriosclerosis by the method of Kernohan et al.20 For each specimen, all arteries with an outer diameter >60 μm were examined using an eyepiece micrometer. The outer diameter and the lumen diameter of the least axis of the elliptic profile were directly measured. The wall-lumen ratio was calculated in each artery as lumen diameter/(outer diameter − lumen diameter)/2, and the mean value for all arteries in all subjects was used as the index of arteriosclerosis. We further classified all arteries into four categories according to the outer diameters of the renal arteries—60 to 149, 150 to 299, 300 to 499, and ≥500 μm—and calculated the mean values of the wall-lumen ratio by the previously mentioned categories. The severity of arteriolar hyalinosis was assessed semiquantitatively by the method of Barder et al.21 For each tissue specimen, 50 arterioles were examined and the severity of the lesion in each arteriole was graded from 1+ to 4+ according to the extent of arteriolar hyalinosis. The arteriolar hyalinosis index was calculated by the following formula: Arteriolar hyalinosis index = (n1× 1 + n2× 2 + n3× 3 + n4× 4)/50. Here, n1, n2, n3, and n4 indicate the number of arterioles showing hyalinosis scores of 1+ to 4+, respectively. The semiquantitative score was used to evaluate the severity of glomerular sclerosis by the method of Raij et al.22 For each tissue specimen, 100 glomeruli from the superficial to deep cortex were examined uniformly, and the severity of the lesion in each glomerulus was graded from 0 to 4+ according to the percentage of glomerular sclerosis. The glomerular sclerosis index was calculated by the following formula: Glomerular sclerosis index = (n0× 0 + n1× 1 + n2× 2 + n3× 3 + n4× 4)/4. Here, n0, n1, n2, n3, and n4 indicate the number of glomeruli showing sclerotic lesion scores of 0 to 4+, respectively. To differentiate the effects of cardiovascular risk factors from age-related changes, we selected 103 subjects who had none of the following characteristics: Proteinuria, kidney failure, hypertension, glucose intolerance, or primary renal disease at autopsy. Using this subgroup, the cutoff limits were defined as below the 10th percentile or above the 90th percentile of each histologic parameter distribution; that is, renal arteriosclerosis, arteriolar hyalinosis, and glomerular sclerosis were defined as a wall-lumen ratio <3.37, an arteriolar hyalinosis index >1.44, and a glomerular sclerosis index >17.0, respectively. In the analysis by the size of renal arteries, furthermore, renal arteriosclerosis was defined as below the lower 10th percentile for mean values of the wall-lumen ratio by size (60 to 149 μm: wall-lumen ratio <3.56; 150 to 299 μm: wall-lumen ratio <2.65; 300 to 499 μm: wall-lumen ratio <2.64; ≥500 μm: wall-lumen ratio <2.44). BP was measured three times after a single rest period of at least 5 min using a standard mercury sphygmomanometer with the subject in the recumbent position. The mean of the three measurements was used for the analysis. BP levels were categorized according to the criteria recommended by JNC-79 (normal: SBP <120 mmHg and DBP <80 mmHg; prehypertension: SBP 120 to 139 mmHg or DBP 80 to 89 mmHg; stage 1 hypertension: SBP 140 to 159 mmHg or DBP 90 to 99 mmHg; stage 2 hypertension: SBP ≥160 mmHg or DBP ≥100 mmHg). Glucose intolerance was defined by an oral glucose tolerance test in the subjects with glycosuria in 1961 and 1967; by fasting and postprandial glucose concentrations in 1974, 1978, and 1983; and by a 75-g oral glucose tolerance test in 1988, in addition to medical history of diabetes. ECG abnormalities were defined as Minnesota codes 3-1 and/or 4-1, -2, -3. Serum total cholesterol levels were measured by the Zak-Henly method with a modification by Yoshikawa in 1961 and 1967, by the Zurkowski method in 1974, and by the enzymatic method after 1978. Serum creatinine concentration was measured by the Jaffe method after 1974, and GFR was calculated by the MDRD Study Group formula.23 Freshly voided urine samples were tested by the sulfosalicylic acid method in 1961 and 1967 and by the dipstick method after 1974. Proteinuria was defined as 1+ or more. Body height and weight were measured in light clothing without shoes, and the BMI (kg/m2) was calculated. Information on antihypertensive medication, alcohol intake, and smoking habits was obtained through a standard questionnaire and classified as current habitual use or a lack thereof. All available information about potential cardiovascular diseases, including stroke, myocardial infarction, and coronary intervention, was gathered and reviewed by a panel of physician members of the Hisayama Study to determine the occurrence of cardiovascular disease under the standard criteria. A history of cardiovascular disease was determined on the basis of this information. Target organ damage was defined as the presence of ECG abnormalities, proteinuria, GFR <60 ml/min per 1.73 m2, or a history of cardiovascular disease. SAS software (SAS Institute, Cary, NC) was used to perform all statistical analyses. The crude or age- and gender-adjusted mean values and frequencies of variables were compared among BP levels using Dunnett t test or logistic regression analysis as appropriate. The age- and gender-adjusted or multivariate-adjusted OR and 95% CI were calculated by a logistic regression analysis. P < 0.05 was considered statistically significant in all analyses. This study was supported in part by a Grant-in-Aid for Scientific Research A (18209024); a grant from the Special Coordination Fund for Promoting Science; and a grant from the Technology and Innovative Development Project in Life Sciences from the Ministry of Education, Culture, Sports, Science and Technology of Japan. We thank the residents of Hisayama Town for participation in the survey and the staff of the Division of Health and Welfare of Hisayama for cooperation in this study.